A friend of mine is an antique dealer in Atlanta, and she travels to Europe several times a year on buying trips. One of her favorite areas is Lyon, France, the capital of the Rhône-Alpes region of France, an area known for its outstanding food and magnificent art school. My friend has an excellent eye, and I love everything that she sells. 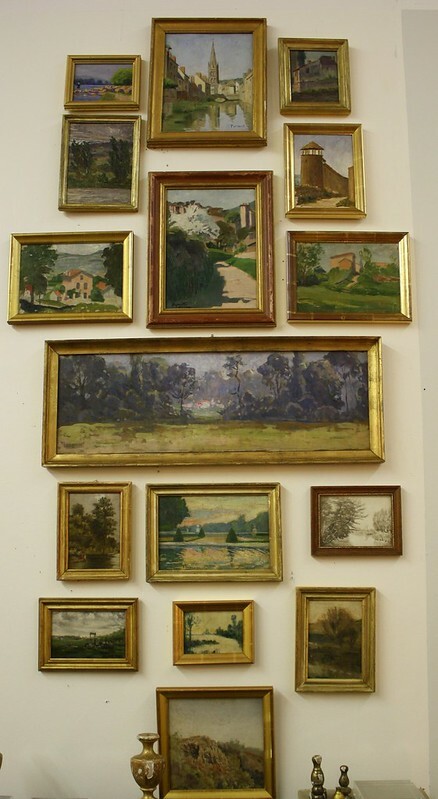 In particular, I was struck with this beautiful group of old and vintage French paintings that she collected over a period of several years; all of the paintings were found in the Lyon, France area, and were painted by French artists. The paintings themselves are lovely, but it is the artful way in which they were arranged that truly enhances their beauty and impact. A collection like this only presents itself on rare occasions (and would take many years to collect!). An approximate of individual measurements can be found in the picture above. Estimated overall measurement of gallery wall grouping is roughly 38"x61", based on how the paintings are hung on the wall in the pictures. They can, of course, be hung any way the owner desires – my friend chose to hang them in this arrangement which I think is quite effective, but the possibilities are endless! The large oblong painting is by Luc Belin. Born in Avignon 1878, died 1957. Listed in Benezit. Village painting at the top in the middle is titled "Le Lezards a Harfleur de Normandie"
All paintings are oil on board except the one on the very bottom in the middle. It is an aqualrelle (water color). All are framed as pictured. This listing is for the 16 paintings hanging on wall only. They are only being sold as a group. The other items in the pictures are for sale individually (the chest, the other paintings, the objects on the chest) and are not part of this listing (please inquire if interested). For advertising and sponsorship opportunities on Things That Inspire, please click here. Posts on Things That Inspire may contain links to sponsor sites. oh my, that is so beautiful. even if i had all of those paintings, there is no way i could have arranged them so beautifully. this is a magazine quality vignette. thank you for showing us, i wish i could buy them! You are so right- they are stunning! Beautiful. I challenged myself to guess the price before I clicked on the link and I was only off by $200. I think the oblong piece is particularly interesting as well as the one on the left just below it. such an amazing presentation and thank you so much for sharing the individual measurements along with the grouping ... really stunning collection!! I would be interested in getting information on the chest. It is charming. Thanks you for a beautiful post. I love the arrangement. Holly this is quite an impressive collection, and the way it is displayed brigs out all of the beauty of these works of art!Off to look! Holly this is stunning! I love it!